For many years, John Kirkland, a very successful timber merchant, saw his business falter when demand for timber for shipbuilding collapsed. By 1883, his business was in liquidation and he was obliged to sell everything, including his home, contents and carriages. Alexander Soutar (1841): Catherine Robertson (1842): John (1844-1844): David Soutar (1846): Margaret Ann (1848): George (1851): Mary Jane (1853): William John (1854-1860): Their second son John died at 3 weeks and was buried in the Howff on 1-02-1844. Established Church: John Kirkland was one of four subscribers towards the purchase of a site at Greenfield Place, Perth Road and was present at the laying of the foundation stone there for St Mark's Church, of which he became an office-bearer. John Kirkland was assumed into partnership, along with his brother William, within his father's timber business by the early 1830s. The firm was named 'William Kirkland & Sons.' At that time, the woodyard and sawmill of the firm were situated on the west side of Trades' Lane. Their father died a few years later on 1 October 1834. At the time of his death, his probate record indicated that he and his sons held equal shares of the firm and that the value of the stock was fairly modest. Brothers William and John continued in business together, under the same title, after the death of their father. Around 1850, the firm sought larger premises and, to that end, they procured then leased an extensive area facing onto Ward Road (upon which was later built the Baptist Church and Gymnasium). By 1860 approximately, John withdrew from their joint business and struck out with his son, David Robertson Kirkland, to form 'John Kirkland & Son.' The firm of 'William Kirkland & Sons' continued to operate under his brother William. John Kirkland's new enterprise operated from premises at the harbour (Victoria Dock). He remained at that site for 20 years, giving up his business in the early 1880s. After his ‘coming of age,’ John himself entered into partnership with his father and brother. The death of their father in 1834, saw John and his brother William gradually expand their business, moving to larger premises in Ward Road by 1850. 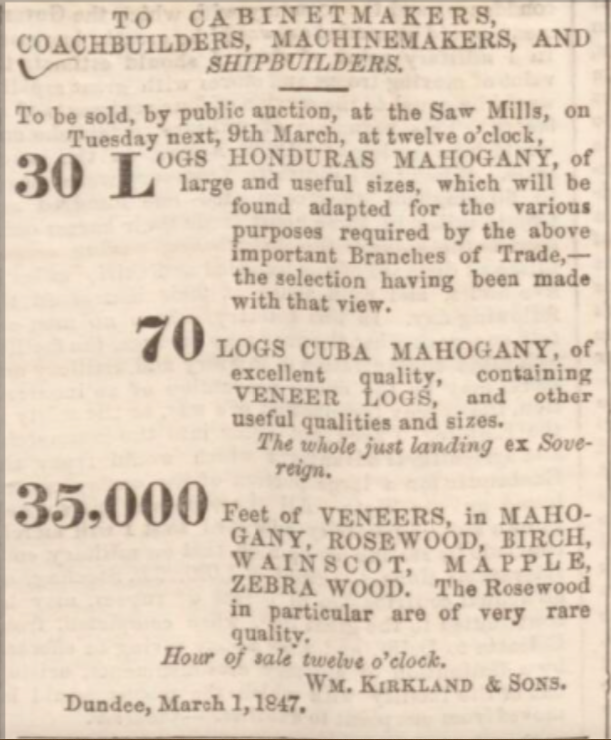 It was stated that the establishment was one of the largest of its kind in the county and ‘the Messrs Kirkland had practically a monopoly of the wood trade in Dundee and district.’ Advertisements of the time offered an indication of the range of woods and purposes to be had from ‘William Kirkland & Sons.’ Imported woods were sourced from Norway, the Baltic and North and South America. The brothers witnessed continued success in the timber trade with ‘William Kirkland & Sons’ from 1834 – circa 1860, at which time, John severed their business partnership. The firm of ‘William Kirkland & Sons’ continued under the sole management of John’s brother William, whose death occurred in 1869. Already in his 50s, John Kirkland began a new venture in ‘Victoria Sawmills,’ together with his son, David Robertson Kirkland. 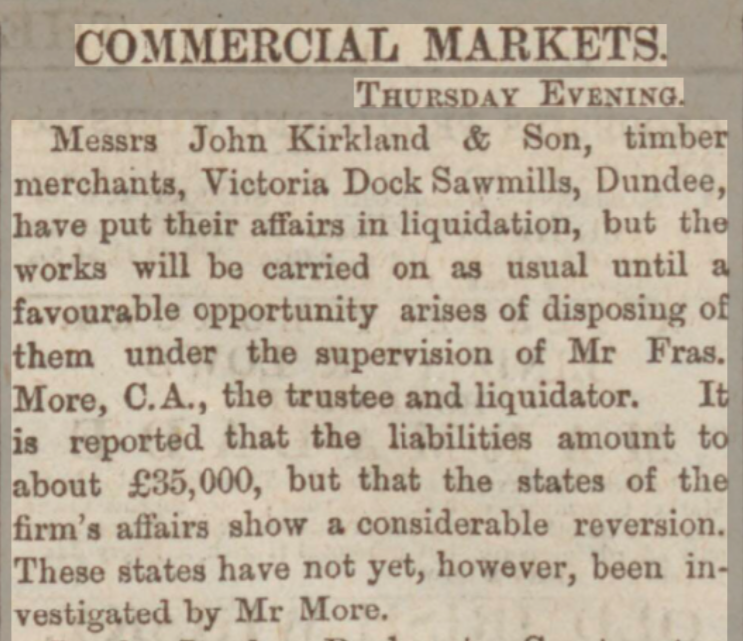 This new firm was titled ‘John Kirkland & Son.’ The following 20 years were ones of mixed fortune due to shifting demands in their commodity. At the height of his prosperity, John Kirkland built ‘Pine Grove,’ Perth Road, at which he lived for many years. It was described as ‘a large and handsomely built residence of 2 storeys, situated on the south side of the Perth Road……enclosing a very beautiful garden and has all the usual accompaniments to a gentleman’s estate.’ Its salubrious location was testament at the time to the position and ambition of its owner. 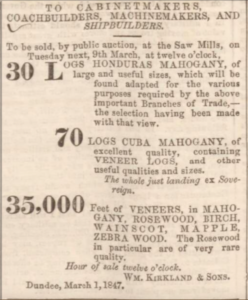 By 1883, the business was forced into liquidation. 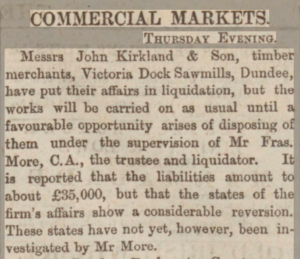 John Kirkland, a well known timber merchant whose mercantile career spanned 75 years, saw both the rise and demise of a family firm. Old Parish Registers. Dundee. Births. (1808). 282/90 342. Scotlandspeople website. Old Parish Registers. Dundee. Marriages. 24 December 1839. 282/220 400. Scotlandspeople website. Census Records. Dundee. (1861). 282/2 27/ 17. Scotlandspeople website. Burials. Howff K04. Friends of Dundee City Archives website. Census Records. Dundee. (1841). 282/103/13. Scotlandspeople website. Dundee Postal Directory, 1842-43. p.44. Dundee Central Library, Local Studies. Dundee Postal Directory, 1846-47. p.126. Dundee Central Library, Local Studies. Dundee Postal Directory, 1850. p.118. Dundee Central Library, Local Studies. Census Records. Dundee. (1851). 282/24 27. Scotlandspeople website. Dundee Postal Directory, 1856-57. p.107. Dundee Central Library, Local Studies. Statutory Registers. Edinburgh. Deaths. 2 June 1896. 685/1 530. ScotlandsPeople website. Dundee Advertiser, 3 June 1896. British Newspaper Archive website. Western Cemetery. Register Volume 1. Register No 301. Compartment 11. Lair No 28. Friends of Dundee City Archives. Lamb Collection. 173/2. Dundee Central Library, Local Studies. Dundee Postal Directory, 1829-30. p.32. Dundee Central Library, Local Studies. Dundee Postal Directory, 1834. p.27. Dundee Central Library, Local Studies. Legal Records. Wills and Testaments. Dundee Sheriff Court. (1835). SC45/31/ 3. Scotlandspeople website. Dundee Postal Directory, 1818. p.34. Dundee Central Library, Local Studies. Dundee Advertiser, 30 April 1869. p.3. Findmypast website. Dundee Ships. 19th Century. (1818-1898). Friends of Dundee City Archives website. Dundee Postal Directory, 1861-62. p.92. Dundee Central Library, Local Studies. Dundee, Perth & Cupar Advertiser. 14 May 1861. p.3. Findmypast website. Statutory Registers. Dundee. Deaths. (1869). 282/3 185. Scotlandspeople website. Ordnance Survey Name Books. (1857-1861). Forfar (Angus). Volume 33. ScotlandsPlaces website. Dundee Advertiser, 2 February 1883. p.4. Findmypast website. The information above about John Luke Kirkland has been collated from a range of digital and hard copy sources. To the best of our knowledge it is correct but if you are relying on any information from our website for the purpose of your own research we would advise you to follow up the sources to your own satisfaction. If you are aware of an inaccuracy in our text please do not hesitate to notify us through our Contact page.